A Magic square is a square of numbers where the numbers are arranged so that all the rows, diagonals and columns add up to the same total. Why is the Loh Shu a magic square? Count the dots! The number of dots on rows, columns and diagonals add to 15. Magic Squares were invented in China. The earliest one so far discovered is from a scroll from 2800 BC called the Loh Shu, an impression of which is shown here. Magic squares are not just a mathematical curiosity. They can have practical use. 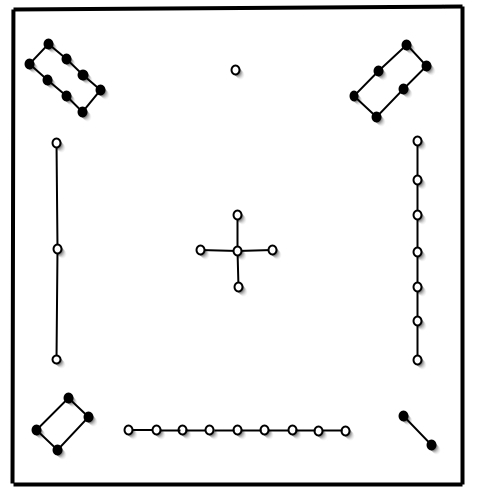 For example you can use the Loh Shu magic square to help you win at the Texting Marakech game.